La Verne was an agricultural town in the mid 1920s, with the economics of the area dependent on the citrus industry. Those pre-depression days were prosperous ones for La Verne’s businesses since the citrus industry was robust. La Verne was flagged with its new name (it was known as Lordsburg until 1917). The real estate offices on D Street were frequented with prospective new residents. Packing houses were clustered south of the town center, adjacent to the train tracks. La Verne was known as having the finest oranges in the region, with boxes shipped to the East Coast and even to Europe. Hardworking families tended to the citrus groves that spread out in all directions from city center to the foothills like a green ocean. When this original picture was taken at the intersection of D and Third streets looking north, Model T’s, with their distinctive wood spoked wheels, were visible on D Street. While it was not unusual to see a horse drawn buggy on the street, a Model T registered status for its owner. In 1925, the “T” cost $290. If the owner opted for an electric starter instead of a hand crank, the cost increased by $65. 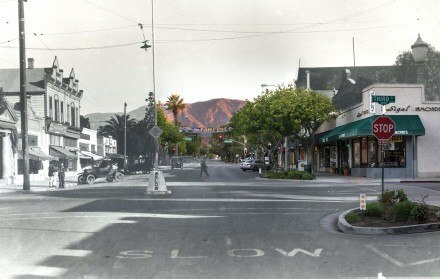 The intersection of D and Third streets has gone through change as La Verne evolved. La Verne was once a self-contained town, with one stop shopping for ranch families. “Traditional” is the word that Galen Beery, president of the La Verne Historical Society, uses to describe the city of La Verne. Like a morphing time machine, Photography Editor Hunter Cole has merged the 1920s past with 2014 present, showing that while the store names have changed, the buildings still anchor the city in its citrus roots.